Chennai, the Indian state capital of Tamil Nadu, is the sixth most populous city in India, and is located on the southeast coast of India. 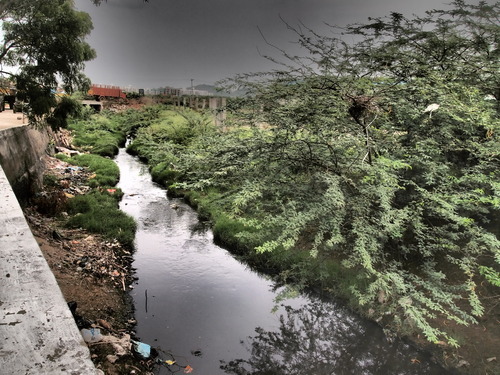 One of the most severe environmental and public health issues facing Chennai is waste, and is currently managed through two refuse dumps, receiving over 5,000 tons of waste every day. A triptych of three posts: “Informally tracking the trash in Mylapore,” “The rural urban divide and caste politics,” and “Perungudi: A fortress of trash” are part of a larger research project that focuses on the economic and sociopolitical influence of the middle class, aiming to enrich existing scholarship around middle class activism in urban India while also bringing to light the influence of their attitudes and actions around waste on lower classes’ relationships with waste. About 30 kilometres (18 miles) outside of the Chennai city is Kuthambakkam, a peri-urban area slated as a model village, thanks in large part to the arduous campaigning of one particular activist, Mr. Rangaswamy Elango, and former President of the town panchayat. Town panchayats are—in theory—autonomous local bodies located in rural or peri-urban areas of Chennai, that should, like the municipalities (including Pammal, discussed for its sustainable waste management initiatives in an earlier post) exist beyond the realm of the Corporation of Chennai (the government arm handling municipal services) or government. However, as Mr. Elango would describe to me, the level of autonomy depends on the leadership; he considers himself to be one of the few, if not only, leaders that has been fully transparent and unwilling to participate in bribery schemes that ensnare politicians, whether in the panchayat, municipality, or Corporation level. The village itself is a few kilometers from the “downtown” area, which has a hodgepodge of commercial centres—from the typical small but fully-stocked roadside convenience stores to a lopsided KFC and a Café Coffee Day (India’s Starbucks). Mr. Elango is most renowned for his Gandhian philosophies and attempts to make Kuthambakkam village panchayat into a model for other Indian villages to be self-reliant and resilient. He has been an active voice in bringing to bear inter-caste tensions, establishing, for instance, “equality housing” areas where a “backward” and “forward” caste must share a building. Through his political activity and persistent litigation, he has also contributed to solid waste management issues in the town panchayat. Among his most renowned efforts is helping to successfully put a stay on a proposed plan to construct a dump yard in Kuthambakkam, where some of the Corporation of Chennai zones’ waste would go. This proposal came in conjunction with large-scale rezoning of Chennai to include 5 more zones within its jurisdiction. While a local activist and writer averred to me earlier this month that the proposal was particularly problematic because Kuthambakkam is predominantly a Dalit (lowest caste) village, Mr. Elango—of Dalit background himself—was hesitant to frame it in this way. “It’s not necessarily because it’s Dalit, but because there is land available here.” According to Mr. Elango, the major opposition to the proposal came not out of some notion of not wanting “their” waste “here,” but that the project itself was not environmentally or socially feasible. “They were proposing to create it upstream on a major reservoir, the ChembarambakkamLake” that not only serves as water source for the village but several areas of the Corporation. “It just doesn’t make sense,” he said. Meanwhile, the engineers proposing the project were promising that there would be no issues, and didn’t take the panchayat folks seriously, claiming that their project was “technically sound.” “What right does the Chennai Corporation have to dump in a local body?” he asked me. After all, the town panchayats are supposed to exist outside the grips of the Corporation. In Mr. Elango’s descriptions of the village’s waste management, it’s obvious that he sees a rather clear distinction between the habits of the city and village folk. Still, although he characterises Kuthambakkam as being peri-urban, he tends to see the breakdown as a binary system, with peri-urban belonging in the village ambit. “If it’s a real village, there is no concept of solid waste management,” he mused. “The whole culture doesn’t allow them to waste.” This is due mainly to the overall impecuniousness of the population, which coincides with the availability—or lack there of—of non-biodegradable products. Food scraps are thrown into a pit behind the hut or house. Farmers with cows will have manure which they either sell off or use in their fields. But his major point was that food does not go to waste in such poor households; only that which can be consumed is prepared each day, leaving very little for the dustbin. When he was growing up, there would even be people who would collect residual animal bones from which phosphorous was extracted. But such a culture doesn’t exist anymore, especially in the city, he said. Instead, people “recklessly generate solid waste” unable to understand the ramifications. While most of my middle class informants have shied away from discussing caste, and instead point to class as being more of a social indicator in Chennai nowadays, Elango is insistent that “development and economics are masking the social, caste system.” Urbanization is just a process; caste is a system, a way of life so deeply entrenched that it has become taken for granted. This caste system entrenchment has in turn translated into not only a lack of empathy, but a sense that certain people belong or deserve certain tasks, such as clearing garbage, or waste picking. Elango’s words reminded me of a Ramky Group (a private company in charge of waste disposal for a few Chennai zones) street sweeper in Mylapore with whom I spoke in April, who echoed this idea that people don’t stop to think that someone is coming behind them to clean up the garbage they throw on the streets. Whether rural, urban, or peri-urban, caste politics persist and are evermore present in how trash is dealt with in Chennai. The people handling the waste —whether the formal Corporation employees or the informal waste workers—are almost certainly of “backward” castes. And while it may be convenient to push aside caste and contend that we’re now dealing with solely class issues, the realities of the system precipitate in such quotidian narratives of struggle and symbolic violence. These posts are a result of a three-month ethnographic study of waste in Chennai, India, by Ashwini Srinivasamohan for her Master of Environmental Science (MESc) at Yale University, and were posted originally on a blog kept during the study period, Talking Trash in Chennai. Her overall research project is centered around middle class attitudes toward waste and their influence on interclass dynamics and urban governance in Chennai, India. This entry was posted in Activism, Difference: Class, Race, Gender, Government, Justice (EJ), Labor, Purity/defilement, Urban, World and tagged caste system, Chennai, Dalit, India, Kuthambakkam. Bookmark the permalink.